A CSA (Community Supported Agriculture) is a commitment between farmers and community members where both share the risks and the benefits of local food production. Members pledge their support by making a payment at the beginning of the season, when the bulk of farm expenditures occur. In exchange, each member receives a weekly share of the season's harvest and the opportunity to be part of sustainable food practices on MDI. The Full Share for $500, designed for families or couples who cook at home 5-7 times a week. The weekly share includes access to pick-your-own herbs and flowers on the farm, and an abundant choice of ‘extras’ at each pick-up. The Working Share for $450, same as above, with a discount for 4-hours of labor at the farm, sometime during the season. Working at the farm, whether harvesting peas, digging potatoes, or weeding a row, has been a popular way to get to know your neighborhood farm. The Petite Share for $325, is designed for busy couples or families who want to enjoy locally grown food, but only have time to build 3-5 meals a week around farm vegetables. There are two options for weekly pick-up: one at St. Saviours Church in Bar Harbor on Tuesdays and one on Fridays at the farm at 115 Gilbert Farm Road. On your signup form, you will indicate which pickup you would prefer. Pickups will begin in mid to late June and will run into October. CSA members will also be able to participate in seasonal potluck dinners, bulk buying opportunities, harvesting parties and community exchanges through our e-newsletter and Bar Harbor Community Farm blog. 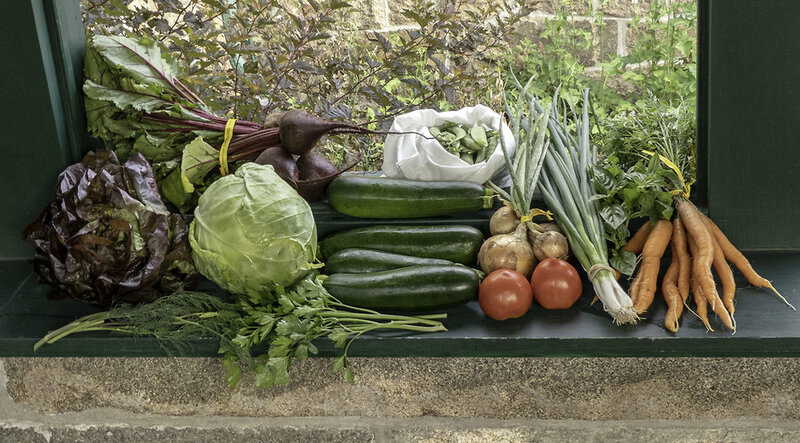 Your weekly box will be filled with a parade of vegetables that reflect the progress of the growing season in Bar Harbor. Each week shares will include popular favorites combined with specialties not found in grocery stores. Expect a variety of greens, radishes, scallions and herbs in the spring. In July, as fruits start to ripen and roots have dug a little deeper, shares will be more colorful with orange carrots, purple beans, yellow summer squash and more. August is the month for fruits. Tomatoes, peppers and melons will ripen in the heat, and boxes will be heavy with lush abundance. As the weather turns cool in September, potatoes and onions and cabbage will bring up the end of the season with winter squashes coming in last. Arugula, Basil, Beet Greens, Beets, Bok Choi, Broccoli, Brussel Sprouts, Bush Beans, Cabbage, Chinese Cabbage, Carrots, Cauliflower, Celeriac, Chard, Cilantro, Collards, Cucumbers, Dill, Eggplant, Flowers, Garlic, Garlic Scapes, Greens, Asian Greens, Kale, Kohlrabi, Leeks, Lemon Balm, Lettuce, Lettuce Mix, Melons, Mint, Onions, Sugar Snap Peas, Peppers, Hot Peppers, Red Potatoes, Fingerlings, Pumpkin, Radish, Black Radish, Watermelon Radishes, Daikon Radishes, Rutabagas, Scallions, Shallots, Spinach, Summer Squash, Tomatoes, Gilfeather Turnips, Hakurei Turnips, Winter Squash, Zucchini and more….